A sliver of land just off China's east coastline, Taiwan represents one of the world's most densely populated countries--and one of Asia's most powerful economies. History buffs on a tour of Taiwan will discover ancient artifacts stored at outstanding national museums narrating nearly 10,000 years of Asia's history. Those interested in more active pursuits can organize a Taiwan itinerary around its modern mountain resorts, well-developed beaches, and protected forests sheltering hundreds of species of native plant and animal life. Begin your visit in Taipei, a vibrant capital city with a thriving entertainment scene, relatively inexpensive accommodations, and an eclectic culinary scene. Taipei: A sprawling, densely populated capital city with a buzzing nightlife and millennia of history, Taipei serves as the first and last stop on most Taiwan itineraries. Kaohsiung: An ever-growing hub of Taiwan tourism and home to the country's largest port, Kaohsiung offers historical and modern architecture, as well as easy access to nearby beaches. Taichung: Perched on the island's west coast and known for its pleasant climate, the culturally rich city of Taichung offers a great range of art galleries and museums to add a touch of class to your Taiwan holiday. Taipei 101: Soaring to a height of 509 m (1,671 ft), the most famous attraction in Taiwan was officially the world's tallest building between 2004 and 2009, dwarfing all the structures that surround it. National Palace Museum: Established in the 1920s, this palace now serves as a museum displaying more than 700,000 culturally and historically significant artifacts. 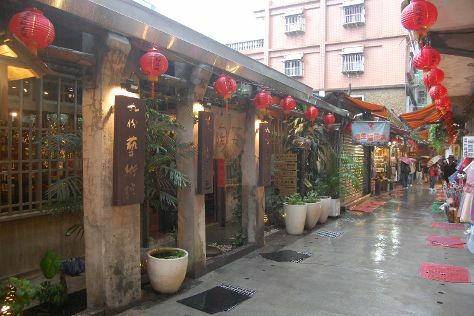 Chiufen (Jiufen Old Street): A highlight of any shopping holiday in Taiwan, this traditional Chinese street offers an abundance of shops, stalls, and eateries decorated with colorful red lanterns. Longshan Temple: Built by Han Chinese settlers in 1738, this ornately decorated temple in Taipei represents one of the most famous and recognizable Buddhist attractions in Taiwan. Chiang Kai-Shek Memorial Hall: Dedicated to the former Chinese president, Taipei's most distinctive memorial building cuts an imposing figure in the capital, its white marble exterior glistening in the sunlight. Taroko Gorge: Explore this marble-rich natural formation by car, and you'll be rewarded with impressive river and mountain scenery as you wind your way along the serpentine road. Shilin Nightmarket: The rich aroma of freshly cooked street food wafts through the air at this bustling night market, which also offers plenty of stalls selling souvenirs and traditional gifts. Taipei Zoo: Adorable pandas steal the show at this zoo, which shelters a wide range of native and exotic animals, and serves as one of the best family-friendly attractions in Taiwan. Beitou Hot Spring: Soak yourself calm at these natural hot springs, which serve as an oasis of tranquility in the throbbing heart of Taipei. Danshuei: A hotspot of Taiwan tourism, this popular waterfront district bustles with cafes and restaurants, and has a reputation as one of the best places in the city for sunsets. You won't have any problem finding family-friendly attractions in Taiwan, with plenty on offer across the country's safe and welcoming cities. Start in the capital, Taipei, where an abundance of shopping malls, parks, and vantage points offering lofty views will keep the little ones entertained. Expand your Taiwan itinerary south to include Kaohsiung and take trips to nearby beaches, where the kids can splash themselves silly. If your kids have plenty of energy to burn, make use of the excellent outdoor attractions in Taiwan, where they'll be able to run and play to their heart's content. Introduce them to the pandas at Taipei Zoo, then embark on the trail up Elephant Mountain (aka Nangang District Hiking Trail) to get a taste of the jungle and enjoy pleasant views over the city. You can earn even better panoramic views by heading to the top of Taipei 101, where your kids can take some amazing photos to remember their Taiwan vacation by. Outside the capital, you can treat your kids to some breathtaking scenery by taking them for a drive through Taroko Gorge. With a wide selection of child-friendly accommodations--many of which even offer play equipment to help the little ones burn off their energy--a family holiday in Taiwan can be a breeze. To help your family get more easily from place to place, consider hiring a car with a driver, who can navigate the country's crowded roads effortlessly and suggest places to stop along the way. Remember to pack wet weather gear for all members of the family--Taiwan's tropical climate means intense rain storms can hit quickly and without much warning. A trip to Taiwan offers a chance to embark on a culinary journey through a land in which delicious meals and snacks form an important part of everyday life. As you wander through food courts like Shilin Nightmarket, you'll have the opportunity to try tasty rice- and noodle-based dishes, with pork, beef, chicken, and vegetables dressed in spicy, flavorsome sauces. If you head west to Taichung, make sure you try the sweet sun cake--made of flaky pastry and honey--for dessert. Known as a great place to buy inexpensive electronics, Taiwan offers a large array of shopping malls and open-air markets to cater to whatever you might need during or after your trip. Head to Guanghua Mall, where you can find a wide range of electronics, including computers, video games, radios, and accessories. For traditional souvenirs to remember your Taiwan holiday by, head to Chiufen (Jiufen Old Street) or Shilin Nightmarket, where you'll get a real sense of the country's shopping culture. A trip to Taiwan offers a chance to experience a different culture that, despite the country's strong Western influence, remains in many ways traditional. Taiwanese etiquette still plays a major part in everyday life, and failure to adhere to this could potentially lead to some embarrassing cultural faux pas. Avoid pointing with your finger, touching people on the head, or putting your arm around someone's shoulder, as these are considered aggressive gestures. During your Taiwan vacation, you should also avoid public displays of affection, as locals will perceive this as rude and inappropriate. Thanks to its strong cultural ties with China, Taiwan shares many holidays and festivals with its mainland neighbor. If you happen to holiday in Taiwan--especially Taipei--at the end of January or beginning of February, you can experience Chinese New Year and witness a two-week-long display of dragons, feasts, and festivities in the street. The dragon theme pops up again in June, when the dragon boat festival sees an elaborate exhibition of color hit the water across the country. You can add a more somber tone to your Taiwan vacation by witnessing the Tomb Sweeping Festival on April 5, when families visit their ancestors' graves to show respect and give the burial sites a good clean. Taiwanese culture places restrictions on physical contact, including handshakes. When meeting someone for the first time during your Taiwan vacation, a nod or a shallow bow will serve as more appropriate gestures than a handshake. You can offer a handshake once you get to know the other person a bit better. Instead of introducing yourself straight away, wait for a third person--perhaps a mutual acquaintance--to introduce you to new people. No matter what time of year you vacation in Taiwan, you're likely to enjoy pleasant weather and good conditions for sightseeing. The small island experiences a subtropical climate, with the annual average temperature sitting at a comfortable 22 C (72 F). Coastal areas, such as Taipei and Kaohsiung, also benefit from cool sea breezes, which provide some respite on particularly hot and humid days. You might need a light jacket if you take a trip to Taiwan in winter, between December and February, and you should bring wet weather gear no matter when you visit. Rain storms tend to be brief, but regular and intense. Most Taiwanese stop what they're doing and wait undercover until the deluge dies down. Excellent infrastructure and relatively short distances between cities make getting around on your Taiwan vacation an absolute breeze. When traveling within Taipei and Kaohsiung, you can make the most of the efficient MRT (Mass Rapid Transit) rail, which connects well with city bus routes and offers signs in English, as well as Chinese. A high-speed train line connects the two major cities, while the country's road network offers scenic routes for you to explore during your Taiwan trip. You don't need to stress too much about tipping during your Taiwan holiday. Restaurant servers don't rely on tips and bills usually include a service charge. You'll also find that most taxi drivers and hotel employees don't expect tips either. If you visit a spa or take a guided tour in Taiwan, be prepared to tip 10 percent.